Hi, I downloaded free version of the app. I like it. One question: does it “wreck” my coding to go to a paid license ? Dear Customer Support, I need to call the customer service. Do you have a phone number for the customer service? October 16, 2013 Can I use free css menu with Dreamweaver? I use Dreamweaver and do not know how to get the menu attached into the program. If I can't use Dreamweaver. October 11, 2013 Am I allowed to use menu css free version? I'd like to add your Css3Menu to my site. But I'm not sure that I'm allowed to use free version. How can I know it? I'm testing free version now. But i can't understand the difference between target blank, parent, etc. Where can I find more info about this property? 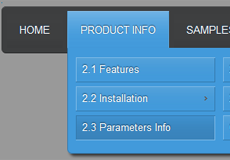 We would like to confirm that units have to support large scrollbar submenu as shown in the attachment. I just purchased CSS3Menu because I wanted to use the Mega Menu CSS3 Template that I saw on your website.